About 85 kilometers southeast of Manila, hidden in the springs of the province of Laguna, lies a community that brings leisure and relaxation together called the Caliraya Springs Golf and Marina Leisure Community. Caliraya Springs is a community that offers scenic views of the mountains, neighboring lakes, and the nature that surrounds it. That’s what makes Caliraya such a relaxing getaway, highlighted by its championship golf course. The design of the 18-hole championship course is brought by the architectural ingenuity of the golf legend Arnold Palmer. Palmer took advantage of the scenic Caliraya Lake and utilizesd its natural topography and the rolling terrain to create rolls from tee to fairways and to greens. The 6,788 yard lakeside course is designed to be friendly but still poses some challenges paired with hills and water hazards by the lakeside. 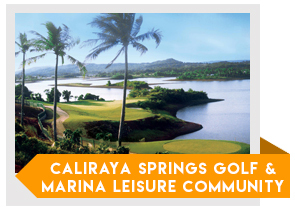 The Caliraya Springs Golf and Marina Leisure Community offers other facilities that can accommodate other golfers’ needs. The clubhouse has a huge lounge where golfers can dine and unwind while enjoying the cool breeze of the golf course. They also have spacious male and female locker rooms, sauna and jacuzzi’s surrounded by picturesque views of the course. Other facilities include a fine dining restaurant, a bar, and a pro shop. There is also a driving range, practice putting green and tee houses on the fairways. Getting there will require a 2 hour or more drive from Manila. There are three routes to get there. Route 2: by using the route of Antipolo, to Morong,to Paete, and then to Cavinti. Route 3 of Taytay, to Binangonan, to Morong, to Paete, and then to Cavinti.